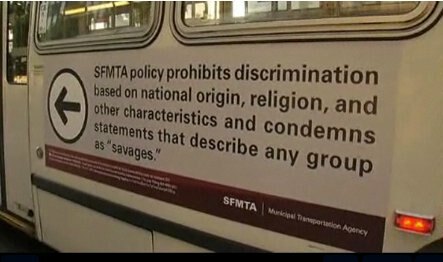 San Francisco’s Municipal Transportation Agency, Muni, has been under fire for accepting ads referring to Arabs and Muslims as “savage” that were placed by anti-Muslim activist Pamela Geller. The ads declare that “in any war between the civilized man and the savage, support the civilized man”—a paraphrase of an Ayn Rand quote—while also urging readers to “support Israel” and “defeat jihad.” If Muni had rejected the ads, however, it likely would have violated Geller’s First Amendment rights; when New York’s Metropolitan Transportation Authority tried to block Geller’s ads last year, Geller sued, and in July a judge later declared the agency’s ad policy unconstitutional. The arrow in the image points to Geller’s ad, functioning as a kind of disclaimer. As I reported last week, Muni is also donating the money Geller paid for the ads to the San Francisco Human Rights Commission. Geller is apoplectic, and has referred to the disclaimers as “shariah-compliant,” implying that Muni’s response is a reflection of adherence to Islamic law rather than an attempt to tamp down a public relations debacle. So Rand wasn’t merely referring to just to Muslims, to Palestinians, or even to terrorists. She was describing all Arabs as “savages.” Geller, who named her blog “Atlas Shrugs” after Rand’s novel, surely understood this context when she chose the quote.